White mold, or lettuce drop, caused by Sclerotinia sclerotiorum, has been reported. White mold can cause serious losses in lettuce and other susceptible crops if left uncontrolled. 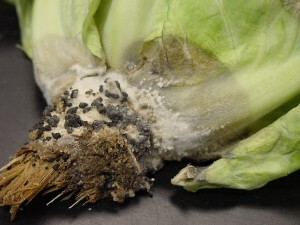 White mold on lettuce. Notice the white fungal growth and black sclerotia developing on the base of the stem. The sclorotia can survive in the soil for up to 10 years. The sclerotia of the fungus can survive for up to 10 years in the soil once fields become infested. Infected plants typically show symptoms soon after transplanting or as plants reach maturity when entire plants will wilt and collapse very quickly. In cool, wet soils the fungus will infect the host and produce the characteristic white fungal growth on stems of infected plants, eventually black sclerotia will develop. Control of white mold begins with preventative fungicide applications soon after transplanting. For lettuce: Apply one of the following fungicides at transplanting and/or thinning (see labels for instruction): Cannonball (fludioxonil, 12) at 7.0 oz. 40WP/A; iprodione at 1.5 to 2.0 lb 50WP/A (2 applications per season allowed); Endura (boscalid, 7) at 8.0 to 11.0 oz. 70WP/A (suppression only, 2 applications only); Quadris (azoxystrobin, 11) at 0.40 to 0.80 fl oz./100 0 ft row 2.08F. For cabbage and related crops: Apply Endura (boscalid, 7) at 6.0 to 9.0 oz 70WG/A (only 2 applications per season), or Fontelis (penthiopyrad, 7) at 16.0 to 30.0 fl oz. 1.67SC/A. For organic growers, Contans (Coniothyrium minitans) is a biological control with an OMRI-approved label. Coniothyrium minitans is a fungus that will attack and destroy the sclerotia of white mold. To work effectively, Contans must be applied at 2 to 3 lbs/A to the soil up to 2 to 3 months prior to the crop. For more information on the control of white for these and other susceptible crops such as beans, peas, carrots, leeks and tomatoes (Timber rot) please see the 2014 Commercial Vegetable Production Recommendations Guide.